A recent member of this group is ultra thin black phosphorus monolayers (Ling et al., 2015) which have shown considerable promise in basic science as well as in potential technological applications. All these 2D materials have shown remarkable promise, which can overcome the defects of graphene to a greater extent. These chemical moieties have been recently investigated as an alternative to graphene, which, for the past few decades, has found tremendous applications in many fields. As one of the main components of nucleic acids, phosphorus is an essential element for sustaining life, making it a biocompatible material with extensive applications in the biomedical field (Kou et al., 2015). Among the three isotopes of phosphorus, a new 2D material known as black phosphorus (BP) has gained spectacular status in the scientific world recently, owing to its unique layered structure and layer-dependant properties. It possesses good biocompatibility, good renal clearance, and low toxicity in its nanodot and monolayer form compared to its bulk crystal counterpart, which is more toxic and does not possess good renal clearance. Early work on bulk BP was done over a century ago by Bridgman, who successfully obtained bulk BP crystals for the first time in history in 1914. Later on, in the 1970s and 1980s, a few Japanese groups made some progress in BP research with crucial studies about its electrical and optical properties and successful n-type doping by tellurium (Kang et al., 2015). But, on the whole, these early works did not receive much attention from the scientific community at that time. It wasn’t until 2014, when studies on graphene, transition metal dichalcogenides, monolayer hexagonal boron nitrile, etc., underwent a renaissance, that monolayer BP, from the perspective of a thin layer 2D material, got rediscovered. This rediscovered BP, having an orthorhombic crystal structure with five outer shell valence electrons, has attracted the interest of researchers all around the world. Like graphene, BP has a single element layered structure consisting of phosphorus atoms (Fig: 1A). BP has received immense scientific attention due to its inherent physio-chemical, electronic, and optical properties, which make it useful for various biomedical applications. BP exhibits strong light-matter interactions, high carrier mobility, and tunable band gap as well as anisotropic physical characteristics that have contributed to its tremendous applications in the field of photonics and biomedical technology. The various physicochemical characteristics exhibited by BP include tunable band gap and band gap-dependent properties, good carrier mobility, and ON-OFF current ratio superior to other 2D materials, anisotropy due to its crystal lattice structure, excellent biocompatibility, and appreciable in vivo biodegradability. Fig: 1(A) Structure of black phosphorus, (B) Synthesis methods of black phosphorus. Figure republished with permission from Mohanan PV. Fabrication of thin, BP-like 2D nanomaterials are generally categorized into two basic approaches, “top-down methods” and “bottom-up methods.” Top-down methods generally focus on bulk material exfoliation with the aid of a driving force (mechanical exfoliation, liquid exfoliation, plasma-assisted methods like plasma etching, ultrasonication assisted exfoliation, electrochemical methods, etc. ), thereby breaking down into small nanoparticles a few nanometers in size (Fig: 1B). The bottom-up method involves chemical synthesis and direct fabrication of nanomaterials from its specific precursor material (eg: chemical vapor transport, wet lab methods, etc.). Despite its various exciting properties, one major drawback that hinders BP application is the instability of BP when exposed to external environmental conditions. Mainly, when it comes into contact with oxygen, water, light, or temperature, chances are severely high that this material will degrade (Wang et al., 2015, Island et al., 2015). 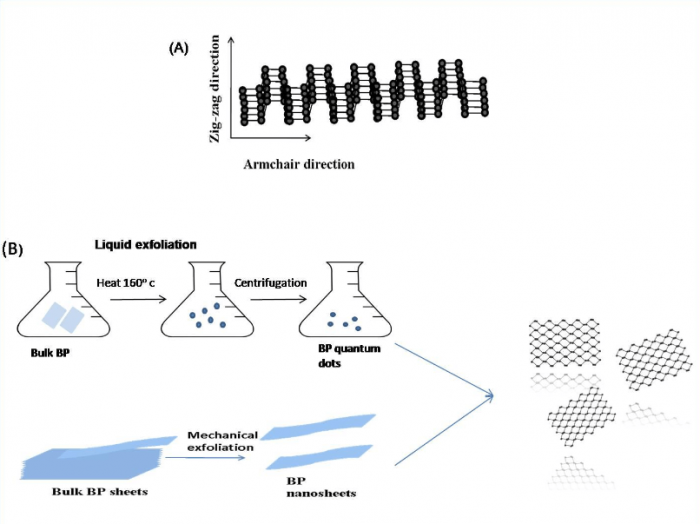 In order to overcome these strategies, various surface modifications are being explored for proper stabilization and functionality enhancement as well as to avoid rapid degradation of BP nanomaterials. Usually, surface coatings have provided various chemical groups like polyethylene glycol (PEG), titanium sulfonate ligand, Al2O3, aryl diazonium, etc., which have proved to be effective ingredients for stabilizing BP. Usually, in the manufacturing of FET biosensors, Al2O3 is used as a coating material using an atomic layer deposition method that improves its stability and reduces degradation to a greater extent. PEGylated BP nanosheets were found to possess remarkable stability in PBS and cell culture media. In situ surface modification of BP using potassium is another possibility to reduce rapid degradation and to enhance basic fundamental properties of BP. Potassium induces giant electron doping sites on the BP surface with a clear reduction in band gap which also enhances electron mobility by the order of one after potassium surface modifications (Han et al., 2017). Apart from protection, surface modifications can be made to improve the properties of BP which contributes to its potent biomedical applications by improving its biocompatibility. In FET biosensors, metal oxides like Cs2CO3 and MoO3 are used as surface coatings via chemical doping to enhance its transport properties and to protect it from degradation in air ambient exposure. Compared to other 2D materials, BP nanoparticles have gained popularity due to their exceptional structural and physicochemical characteristics that make it an efficient candidate for various biomedical applications (Fig: 2). Due to its excellent photothermal properties and high surface area, it can be suggested as an excellent candidate for drug delivery, cancer imaging, or cancer phototherapy. Rapid degradability of BP has paved the way for future therapeutic applications, especially in cancer therapies, because of its good biocompatibility because soon after targeting a particular site, these nanoflakes are degraded into biocompatible phosphorus oxides in vivo. Recently, ultra-small derivatives of BP nanosheets were synthesized and found to be excellent NIR- absorbing photothermal therapy (PTT) agents, which can be used for targeted destruction of cancer cells (Li et al., 2010). Another reported major application of BP lies in neuronal regeneration in which Wansong Chen et al., (Wansong et al., 2017) emphasized that BP nanosheets can capture excess elements like copper present in brain by crossing the blood-brain barrier and acting as a neuroprotective agent by selectively protecting neuronal cells from copper-induced neurotoxicity. Thus, it opens up treatment modalities for chronic conditions like Alzheimer’s, Parkinson’s, etc. Yet another underlying biomedical application of BP lies in 3D printing scaffolds, which is an emerging field offering revolutionary research potentials in tissue engineering, which is considered as a new initiative in biomedical technology. Various artificial 3D scaffolds can be fabricated ranging from bone tissue regeneration, cancer therapy, and even artificial organ generation (Yang et al., 2018). 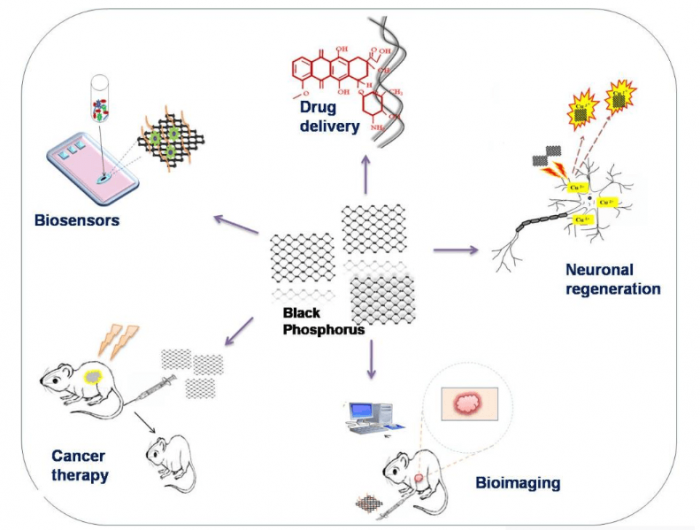 Fig: 2 Biomedical applications of black phosphorus including biosensing, diagnostic imaging, drug delivery, neuronal regeneration, cancer therapy, etc. Image republished with permission from Mohanan PV. BP can be employed as an efficient candidate in a biosensing platform for effective detection of various analytes in biological samples. It has, therefore, been used in designing Field Effect Transistor (FET) biosensors, fluorescent biosensors, colorimetric biosensors, chemical gas sensors, etc. BP shows about a 20 times higher chemical sensitivity to toxic gases compared to other 2D materials like MoS2 and graphene. It shows a nearly 40 times faster response time of target analytes compared to other chemical gas sensors, which shows the potential of BP in chemical gas sensor fabrication (Li et al., 2015). BP has been identified as an excellent choice for FET biosensors due to its unique characteristics like large tunable band gap, high surface area/volume ratio, high ON-OFF current ratio, good carrier mobility, etc. BP has also been suggested as a versatile candidate for label-free colorimetric detection of target analytes and biomarkers. Various studies have reported the efficacy of BP as electrochemical biosensors, fluorescent biosensors, etc., making it a good candidate for biosensor fabrication as well. 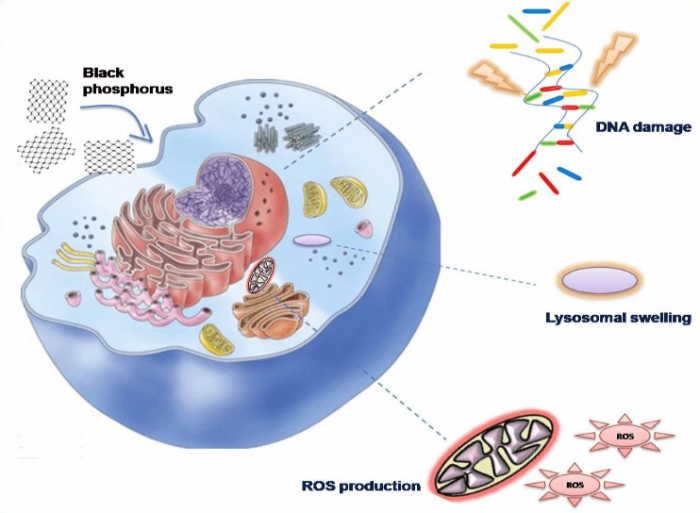 Fig: 3 Possible toxic effects of black phosphorus nanoparticles inside living cell. Image republished with permission from Mohanan PV. Preliminary scientific research confirmed that nano-sized particles are toxic to animal life; therefore, nanoparticles should undergo a full safety evaluation before suggesting them for practical biomedical applications (Fig: 3). While considering BP, very few studies were done to evaluate its toxic potential. Recently, some studies have reported that BP quantum dots showed negligible toxicity in vitro when compared to that of other 2D analogs. Reports suggest that this was found to be lesser than the reported toxicity of graphene oxide NPs and slightly more toxic than other 2D transition metal dichalcogenides like MoS2, WS2, etc., (Qu et al., 2017, Song et al., 2018). The possibilities to study the effect of BP thin layers during cellular interactions, which has not been explored to date, are exponentially increasing. Despite many halting challenges, there is better hope that there will be more research focusing on unveiling those undiscovered unique fundamental applications of BP monolayers for future biomedical applications. 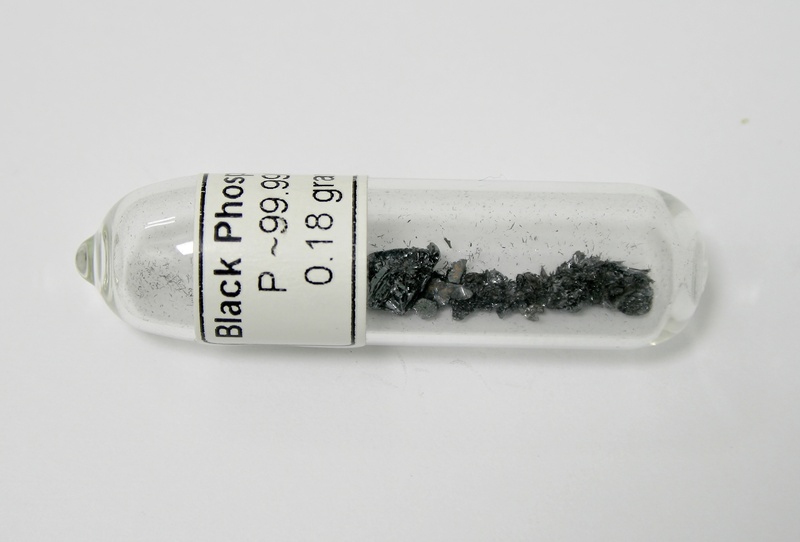 These findings are described in the article entitled Black phosphorous, a prospective graphene substitute for biomedical applications, recently published in the Materials Science & Engineering: C, 2019, 9, 978-993. The work was done by Anju S, Ashtami J and Dr. Mohanan P V from Sree Chitra Tirunal Institute for Medical Sciences and Technology (Govt. of India), Trivandrum, Kerala, India. Han, Cheng, Zehua Hu, Lidia, C Gomes, Yang Bao, Alexandra Carvalho, Sherman JR Tan and Bo Lei (2017). Surface Functionalization of Black Phosphorus via Potassium toward High-Performance Complementary Devices. Nano letters 17 (7): 4122-4129. Island, Joshua O, Gary A Steele, Herre SJ, van der Zant and Andres Castellanos-Gomez (2015). Environmental instability of few-layer black phosphorus. 2D Materials 2 (1): 011002. Kang, Joohoon, Joshua D Wood, Spencer A Wells, Jae-Hyeok Lee, Xiaolong Liu, Kan-Sheng Chen and Mark C. Hersam (2015). Solvent exfoliation of electronic-grade, two-dimensional black phosphorus. ACS nano 9 (4): 3596-3604. Kou, Liangzhi, Changfeng Chen and Sean C Smith (2015). Phosphorene: fabrication, properties, and applications. The journal of physical chemistry letters 6 (14): 2794-2805. Kurapati Rajendra, Kostas Kostarelos, Maurizio Prato and Alberto Bianco (2016). Biomedical uses for 2D materials beyond graphene: current advances and challenges ahead. Advanced Materials 28 (29): 6052-6074. Li, Peng, Dongzhi Zhang, Jingjing Liu, Hongyan Chang, Yan’E. Sun, and Nailiang Yin (2015). Air-stable black phosphorus devices for ion sensing. ACS applied materials & interfaces 7 (44): 24396-24402. Li, Zhiming, Peng Huang, Rong He, Jing Lin, Sen Yang, Xuejun Zhang, Qiushi Ren, and Daxiang Cui (2010). Aptamer-conjugated dendrimer-modified quantum dots for cancer cell targeting and imaging. Materials letters 64 (3): 375-378. Ling, Xi, Han Wang, Shengxi Huang, Fengnian Xia and Mildred S. Dresselhaus (2015). The renaissance of black phosphorus. Proceedings of the National Academy of Sciences 112 (15): 4523-4530. Qu, Guangbo, Wei Liu, Yuetao Zhao, Jie Gao, Tian Xia, Jianbo Shi, Ligang Hu (2017). Improved Biocompatibility of Black Phosphorus Nanosheets by Chemical Modification. Angewandte Chemie 129 (46): 14680-14685. Song, Su-Jin, Yong Shin, Hyun Lee, Bongju Kim, Dong-Wook Han, and Dohyung Lim (2018). Dose-and time-dependent cytotoxicity of layered black phosphorus in fibroblastic cells. Nanomaterials 8 (6): 408. Wang, Gaoxue, Ravindra Pandey and Shashi P Karna (2015). Phosphorene oxide: stability and electronic properties of a novel two-dimensional material. Nanoscale 7 (2): 524-531. Wansong Chen, Jiang Ouyang, Xinyao Yi, Yan Xu, Chengcheng Niu, Weiyu Zhang, Liqiang Wang (2017). Black Phosphorus Nanosheets as a Neuroprotective Nanomedicine for Neurodegenerative Disorder Therapy. Advanced Materials 29: 1603864. Yang, Bowen, Junhui Yin, Yu Chen, Shanshan Pan, Heliang Yao, Youshui Gao, and Jianlin Shi (2018). 2D Black Phosphorus Reinforced 3D Printed Scaffolds: A Stepwise Countermeasure for Osteosarcoma. Advanced Materials 30 (10): 1-12. Yang, Guohai, Chengzhou Zhu, Dan Du, Junjie Zhu and Yuehe Lin (2015). Graphene-like two-dimensional layered nanomaterials: applications in biosensors and nanomedicine. Nanoscale 7 (34), 14217-14231.